Australia sealed their progress into the last eight of the World Cup with a straightforward victory over a spirited Russia side in Nelson. 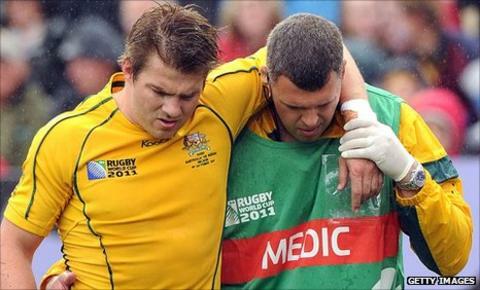 But the Wallabies' win may have come at the cost of winger Drew Mitchell who pulled up with a hamstring problem. Australia, who already have a lengthy injury list, secured a bonus point with four tries in the first 15 minutes before easing off after the break. Russia ended their first World Cup in gallant style, scoring three tries. Victory carried Australia to the top of Pool C, but Ireland require only a draw against Italy on Sunday to replace them and progress to a likely quarter-final against Wales. Mitchell's injury is likely to be another factor for coach Robbie Deans to have to work around in the knock-out stages, with the likes of Kurtley Beale and Pat McCabe absent for their final group match and number eight Wycliff Palu already sent home injured. "It doesn't look good. It looks like it will end his tournament," said Deans of Mitchell's injury. "Drew is bitterly disappointed, the whole team is disappointed for him," added captain James Horwill. Deans had been forced into a raft of changes for Russia, including naming back row forward Radike Samo on the wing, but they looked unhindered by the reshuffle as Berrick Barnes stepped inside fly-half Yury Kushnarev all too easily to touch down for the first score. Barnes' well-weighted chip allowed Mitchell to gather and score before Quade Cooper's cross-field kick was gathered by Samo and Higginbotham's soft offload found its way to Ben McCalman via Nathan Sharpe for a sublime third. A pair of tries for the fit-again David Pocock followed, before Russia rallied and managed to apply some pressure of their own. Scrum-half Alexander Yanyushkin had come came close as he sniped round the edges, before Vladimir Ostroushko capitalised on a Luke Burgess fumble forward to run the ball back down the line and into the corner for the underdogs. But tries from Stephen Moore and centre Adam Ashley-Cooper kept the Australian score ticking on as the half drew to a close. Salesi Ma'afu barged over for the eighth inside three minutes of the restart and Mitchell scored off a quick tap penalty before hobbling off the field as he attempted to sprint clear and complete his hat-trick. An interception score from Denis Simplikevich and a short-range effort from Konstantin Rachkov drew cheers from the crowd, but Barnes, who opened the scoring, capped Australia's win after charging down a kick to score his side's first try since the 49th minute. Australia: James O'Connor; Radike Samo, Adam Ashley-Cooper, Berrick Barnes, Drew Mitchell; Quade Cooper, Luke Burgess; James Slipper, Stephen Moore, Sekope Kepu, James Horwill (capt), Nathan Sharpe, Scott Higginbotham, David Pocock, Ben McCalman. Replacements: Phipps for Mitchell (52), S. Faingaa for Moore (40), Ma'afu for Kepu (30), Simmons for Horwill (40), Elsom for Pocock (40). Not Used: Polota-Nau, Genia. Russia: Vasily Artemyev; Denis Simplikevich, Andrey Kuzin, Alexey Makovetskiy, Vladimir Ostroushko; Yury Kushnarev, Alexander Yanyushkin; Sergey Popov, Vladislav Korshunov (capt), Ivan Prishchepenko, Alexander Voytov, Adam Byrnes, Artem Fatakhov, Vyacheslav Grachev, Victor Gresev. Replacements: Babaev for Kuzin (59), Rachkov for Kushnarev (40), Shakirov for Yanyushkin (63), Botvinnikov for Popov (65), Travkin for Prishchepenko (61), Matveev for Fatakhov (72), Garbuzov for Grachev (50).